Introduction about the za.gl website –This is basically a website which pays out for clicks on the shortened URLs. A blogger can use this website, shorten their post web links. Then promote these shortened links on the public domain. Based on the clicks one can earn money. suggest to check the above video first and then read my review below. I have registered to this website and created a web link for one of my pages. When I clicked on the shorted URL, you can see in my video, it is taking us to an intermediate page. 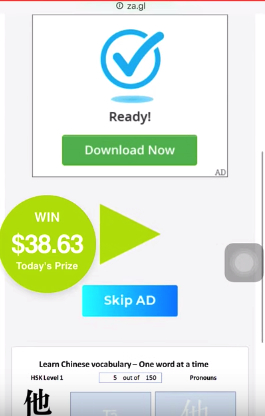 That page is filled with ads and actual web link is at the bottom of the page. After scrolling down, tried to click on my page weblink, it took me to another random website and never took me to my website. How this kind of websites operate and able to payout? Now I understood how Za.gl could pay money to bloggers just by placing their own weblinks. Basically, the website earns money from those advertisers for placing ads on intermediate landing page and pay a fraction of their earnings to the bloggers. Outcome of this is that I didn't reach my intended final page on my blog. Perhaps I didn’t even understand where to click in order to reach the actual webpage. This would be the same case for any average user. What would be consequence of using this kind of services ? 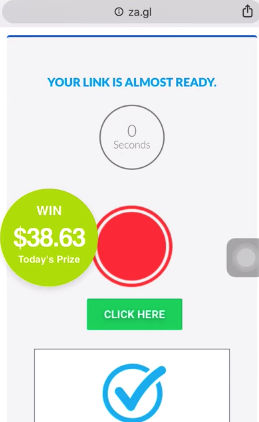 If we use this kind of shortcut ways of earning money, Can you guess what happens? If this link shared on the public domain, you may get few bucks for every unique visit to your blog but the visitor will never click on your post again. I saw another idea of changing the Za.gl link to Bitly link and masking the reality of the za.gl link. But finally whatever link been clicked, one has to go through the same intermediate page with ads and your visit will run away after his first visit. Ultimately you will end up yourselves clicking on your shortened za.gl link to earn money. I suggest don’t go with this kind of shortcut methods of earning money which will lead to bad reputation of your blog and loses the viewership. My conclusion is that this way may not be fake, as people claim that they are earning but Is this necessary to earn this way and losing the visitors? If any suggestions or questions, you are welcome to contact me on murali(at)murali(dot)todayDon’t hesitate to message me on any of the below social media sites, I would answer you soon.